There's a new dish in town and it's Fierce! Enterprising restaurateur Herukh T.Jethwani's latest brainwave inspired him to combine his restaurant's famed Hyderabadi dum biryani with banana leaf thali to create the hybrid speciality of Bir-Nana. 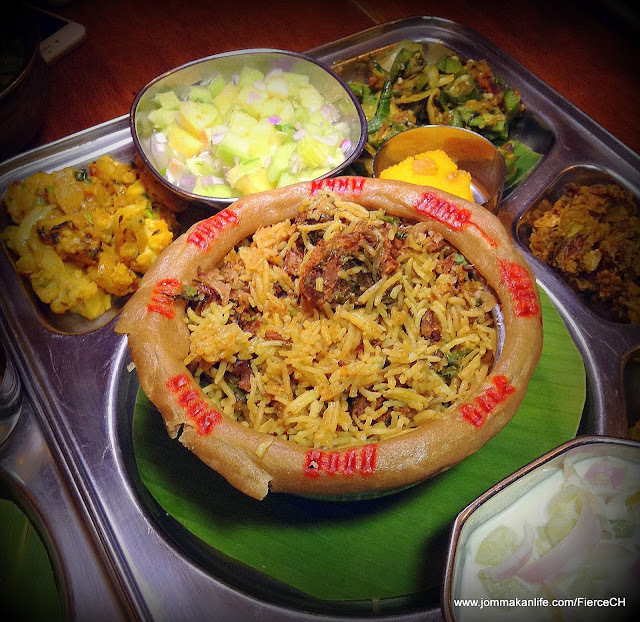 Diners can choose either South Indian or North Indian Bir-Nana Set (RM20-RM26 each) comprising their choice of Biryani (vegetable, mutton or chicken; fish only on Fri), 5 vegetables of the day, rasam (spiced tamarind-based broth), chicken curry or vathal kulambu (spicy, tangy veggie stew), raita, achar, pappadam and kesari (South Indian sweetmeat made from semolina). We highly recommend the Mutton Bir-Nana (RM26) as the biryani comes sealed with dough around the metal dum rim, to ensure all the enticing flavours of Fierce's trademark biryani remain intact. Once the lid is lifted, a whiff of the spices, meat and rice should leave you drooling. Trust me, the first spoonful of this sublime speciality will have you wanting more. 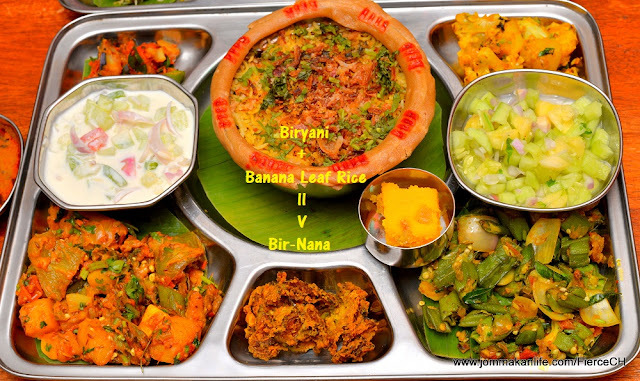 Fierce also serves both South and North Indian Thali (RM10 each) - a fab value-for-money rice set presented in stainless steel compartmentalised tray. 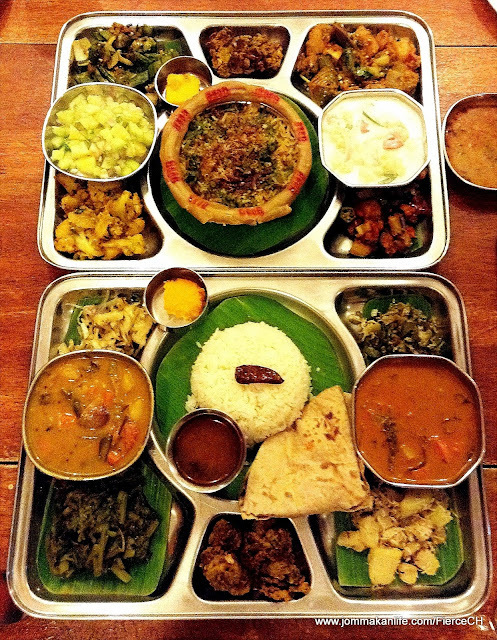 Depending on whether you're going with South Indian (SI) or North Indian (NI), every thali features white rice or par-boiled rice or chapati, 5 veggies of the day (including fried bittergourd chips), chapati, sambar (SI) or dhal (NI), vathal kulambu (SI) or veg curry (NI), rasam, pappadam, salted fried chilli and kesari. Fierce has also introduced a selection of North Indian delicacies for dinner. While we waited for the culinary team to rustle some of the house specials for our sampling, we munched on crispy Onion Pakoras (RM8). Crisp on the outside, the sweet tender rings - cooked to order from 3pm daily - helped us to work up an appetite. From the tandoor comes one of KL's best Chicken Tandoori (RM14 for 1/4 chicken). Suffice to say our dining party had nothing but praises for the chicken which was suitably charred on the outside yet irresistibly juicy inside. If you prefer boneless chunks of meat, the Kebab Palette (RM22) is a godsend with four different variants: Tandoori, Malai, Haryali & Kalmi to tempt you. The Malai Tikka tasted seductively rich and creamy due to its cream, cheese and cashew marinade while we relished the invigorating mint, garlic, ginger, yoghurt and spice accents of the Haryali Tikka. Gram flour, ginger, garlic, cashew and spices form the basis for the Kalmi Kebab, rendering the delectable meat with a profusion of palate-pleasing nuances. Similar options of prawn, fish and paneer are also available priced at RM22-RM32. Pouffy naans pockmarked with slightly charred surfaces are deftly prepared here too. Grab a basket of Mixed Naan (RM12) to share. Besides the plain version, the assortment includes garlic, butter and coriander naans which go superbly with gravy-laden dishes. Perfect examples of those include Orange Prawns (RM30) and the fail-safe Palak Paneer (RM20). The first has springy crustaceans bathed in lightly creamy and subtly sweet gravy but such inventiveness was eclipsed by the spinach and cottage cheese purée's bright lushness. No less decadent was Butter Chicken (RM22) brimming with distinctly smoky tomato and spice overtones. Other notable specialities to consider range from skewers of tandoor-cooked Mutton Rogan Josh (RM25) and Aloo Bhindi (RM14), delightful spiced potatoes with chopped ladyfingers. For reservations at Fierce Curry House, please call tel: 03-2202 3456 or 019-3830 945. The restaurant is located at 16, Jalan Kemuja, Bangsar, Kuala Lumpur. this looks real yummy, I need go to there one of these days.